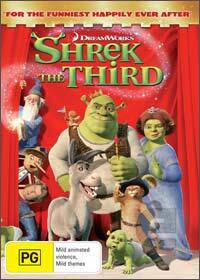 Those loveable characters from the Shrek series make their return in "Shrek the Third" which once again reunites the ogre known as Shrek (Mike Myers), the Donkey (Eddie Murphy) known as Donkey and Puss in Boots (Anthony Banderas) to once again save the realm of Far Far Away Land from the nefarious plans of Prince Charming (Rupert Everett). The story begins in Far Far Away Land where Shrek's father-in-law King Harold (played by John Cleese) has become ill and can no longer remain on the throne and he chooses Shrek to replace him. Unfortunately for Shrek and the citizens of Far Far Away Land, his duties go horrible wrong and Shrek asks the King if there are any heirs to the throne beside him. With his dying words, Harold whispers "Arthur" and this is where Shrek must venture into the unknown to bring this young king home who happens to be played by Justin Timberlake. To compound the situation for Shrek, he discovers that his wife, Princess Fiona (Cameron Diaz) is pregnant and he is plagued by horrible ogre babies rampaging through his nightmares. While Shrek is gone, Prince Charming rounds up a who's who of fairy tale villains to kidnap Fiona and her princess friends. He then attempts to make himself king of Far Far Away. Fiona's fellow princesses - Snow White, Beauty, Cinderella and Rapunzel (played by Amy Poehler, Cheri Oteri, Amy Sedaris and Maya Rudolph) decide they are above trying to help themselves and, in Snow White's words, "assume the position," standing or lying helpless while they wait to be rescued. Fiona, angered and not knowing if anyone will come to save them, motivates the princesses to fend for themselves and they go after Charming and his crew in a humorous action sequence set to Heart's "Barracuda." Meanwhile, Shrek discovers Arthur, or "Artie" as he prefers to be called, jousting Lancelot at Worcestershire Academy. Artie is an awkward teen who gets picked on a lot and is anything but kingly. Shrek finds in Artie a kindred spirit, as he too was picked on and tells him to ignore the names people call him and just trust who he is. The message in Shrek the Third is "be yourself," and while that's been done many times in movies before, it is done to good effect here. Merlin (played by Eric Idle), a past-his-prime wizard turned magic teacher, casts a spell to send Shrek, Donkey, Puss in Boots, and Artie back to Far Far Away where they battle Prince Charming to save the princesses and the kingdom. Although not as entertaining as the original two movies, children will still enjoy this current incarnation of the series as will some adults with the innuendo and sometimes adult orientated humour that is littered throughout the title. Presented in glorious 16:9 widescreen with Dolby Digital 5.1, the animation is amazing as are the sound effects and musical score that make this a great movie on a Plasma or LCD television. The title also contains a plethora of extras which is worth every penny!